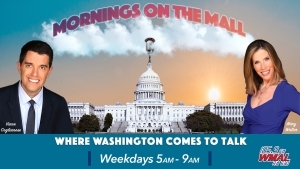 Cal Thomas, Deplorarable Alexander Davis, Judicial Watch’s Tom Fitton and Maryland Senator Clarence Lam joined WMAL on Wednesday! 5am – D/E New bill would allow Maryland food stamp recipients to use them at participating restaurants. ANNAPOLIS, Md. (FOX 5 DC) – A new Maryland bill would expand the state’s food stamp program to allow recipients to use the benefits inside restaurants. The proposed bill will change the state’s food stamp program into a new food supplement benefits program. “I think this is really focused on folks who are in need and that’s why we narrowly tailor it to those who are older individuals above age 60, those individuals who have documented disabilities, and those who are homeless to be able to apply these benefits. It’s not for everyone,” said Sen. Clarence Lam (D – MD 12th District) Senate Bill 752, which introduced was introduced by Lam, has already passed the Maryland House and the Senate. The bill will implement a restaurants meals program and allow specific recipients to use their vouchers inside restaurants all around the state. Restaurants will not be forced to implement the program, rather, they’ll have to apply in order to allow these benefits to be used inside their establishments. Once they do that, qualified individuals will be able to walk into a sub shop, or any kind of permitted establishment, for food. Lam says this law is meant for those who do not have the ability to store or prepare food on their own. It’s an effort several people in the state capital appear to stand behind. AOC Blames Immigration Crisis On ‘Climate Change’: @AOC: The far-right loves to drum up fear & resistance to immigrants. But have you ever noticed they never talk about what‘s causing people to flee their homes in the first place? Perhaps that’s bc they’d be forced to confront 1 major factor fueling global migration: Climate change. Walmart Inc. WMT -0.54% is expanding its use of robots in stores to help monitor inventory, clean floors and unload trucks, part of the retail giant’s efforts to control labor costs as it spends more to raise wages and offer new services like online grocery delivery. The country’s largest private employer said at least 300 stores this year will add machines that scan shelves for out-of-stock products. Autonomous floor scrubbers will be deployed in 1,500 stores to help speed up cleaning, after a test in hundreds of stores last year. And the number of conveyor belts that automatically scan and sort products as they come off trucks will more than double, to 1,200. The company said the addition of a single machine can cut a few hours a day of work previously done by a human, or allow Walmart to allocate fewer people to complete a task, a large saving when spread around 4,600 U.S. stores. Executives said they are focused on giving workers more time to do other tasks, and on hiring in growing areas like e-commerce. Instead, Walmart is spending to battle Amazon.com Inc. and serve more shoppers buying online. Walmart has hired around 40,000 store workers to pick groceries from shelves to fulfill online orders. The company is also raising wages, adding worker training, and buying e-commerce startups. Store workers spend two to three hours a day driving a floor scrubber through a store using the manual machines, said a company spokesman last year. The automatic conveyor belts cut the number of workers needed to unload trucks by half, from around eight to four workers, said executives at a company presentation last June. “With automation we are able to take away some of the tasks that associates don’t enjoy doing,” said Mark Propes, senior director of central operations for Walmart US. “At the same time we continue to open up new jobs in other things in the store.” An additional 900 stores will also get 16-foot-high towers that let shoppers pick up online orders without interacting with a human. 6am – D INTERVIEW – CAL THOMAS – Syndicated columnist – discussed the border crisis and the college fraud parents. BORDER CRISIS / Lib federal judge ruling can’t keep people in Mexico pending asylum hearing. CELEB COLLEGE FRAUD PARENTS: Felicity Huffman to plead guilty in college bribery scam. My view: The proctor who inflated her daughter’s SAT score should be forced to pay the money into a legitimate scholarship program for needy young people. And any coaches representing the school the same. And the schools who took any money directly be forced to underwrite tuition for poor students whose grades are good enough for admission. Lori Loughlin could now face up to 40 years in jail after new charges, report says. (Fox News) — Actress Lori Loughlin and her fashion designer husband, Mossimo Giannulli, two of the 16 parents indicted on fraud and money laundering charges in the college admissions cheating scandal, could face up to 40 years in prison—a maximum of 20 years for each of the charges, a report said. The “Fuller House” star and her husband, along with 14 other parents, are being charged with a “second superseding indictment with conspiring to commit fraud and money laundering,” the Department of Justice revealed in a statement to Fox News on Tuesday. Felicity Huffman Could See Less Than a Year in Prison — But Lori Loughlin Could Face Longer. (people) — Huffman allegedly paid $15,000 to admissions consultant William “Rick” Singer and his nonprofit organization, Key Worldwide Foundation (“KWF”), which prosecutors said was actually a front for accepting bribes. Singer then allegedly facilitated cheating on Huffman’s daughter’s SAT test by having a proctor correct the teen’s answers after the fact. As Huffman decided to plead guilty, the United States Attorney calculated her “offense level” at 9, which has a sentencing guideline of 4-10 months, per the Department of Justice chart. According to the plea documents obtained by PEOPLE, Huffman reserves the right to argue that her offense level should be a 7, which would result in 0-6 months in prison. Additionally, Huffman would serve 12 months of probation, and pay a $20,000 fine. The prosecution agrees to argue that Huffman serve on the “low end” of the sentencing guidelines, meaning that there’s a possibility that she could serve just a few months. Deplorables Tour with Alexander Davis with happen on Saturday, April 13, 2019 at 5:00 PM at the Trump International Hotel in Washington, D.C.
HILLARY CLINTON ATTACKS TRUMP SUPPORTERS AGAIN: The white nationalists certainly think MAGA is a white nationalist slogan. 7am – B/C CANDACE OWENS HEARING: ‘UNBELIEVABLY DISHONEST’ – “I think it’s pretty apparent that Mr. Lieu believes that black people are stupid and will not pursue the full clip…That was unbelievably dishonest…I’m deeply offended by the insinuation of revealing that clip without the question that was asked of me.” – Candace Owens, conservative commentator and communications director for Turning Point USA, at a House Judiciary Committee hearing on online hate speech, accusing Rep. Ted Lieu, D-Calif., of flagrantly distorting her comments on Hitler to smear President Trump and the Republican Party as a whole. 7am – D/E INTERVIEW – TOM FITTON – President, Judicial Watch – discussed Attorney General Barr’s hearing and Judicial Watch’s latest revelations about Hillary’s cover-up. JUDICIAL WATCH NEWS: Judicial Watch uncovers a “cover up” reference in latest production of Clinton email documents. Hillary Contractor Described ‘Cover-up Operation Work Ticket’ in Newly Uncovered Email. (Epoch Times) — A newly obtained internal message from the Denver-based Platte River Networks firm that serviced the personal email system used by former Secretary of State Hillary Clinton for official diplomatic business referenced a “Hillary cover-up operation work ticket archive cleanup,” the nonprofit government watchdog Judicial Watch said on April 8. The email with the cover-up reference is contained in FBI notes on a February 2016 interview of an unidentified Platte River Networks official. Judicial Watch obtained the notes as part of more than 400 previously unreleased FBI documents a federal district court order turned over to the nonprofit as a result of its Freedom of Information Act suit. In the Dec. 11, 2014, email, an unidentified Platte River Network official told another that “I’m kind of freaking about Gresham. Thoughts on what to do with [name redacted].” The official responded: “Its all part of the Hillary coverup operation. I’ll have to tell you about it at the party.” A smiling emoji was inserted by the responder between the two sentences. The “Gresham” reference appears to be to the Chicago-based Gresham Partners LLC. It’s not clear what, if any, connection there is between that firm, which describes itself as “an independent investment and wealth management firm that has been serving select families, family offices and endowments since 1997,” and the “Hillary cover-up operation.” In another of the newly released documents, an unidentified individual working with an inspector from the Office of the Intelligence Community Inspector General told a Department of State official in a June 27, 2015, email that “I have personally reviewed hundreds of documents in the HRC collection. I can now say, without reservation, that there are literally hundreds of classified emails in this collection; maybe more.” It is not known from the documents how many emails were contained in the reviewed collection in which the classified emails were found by the unidentified individual. 8am – A INTERVIEW – MD SENATOR CLARENCE LAM (D – MD 12th District) – discussed his bill to allow food stamps for participating restaurants in Maryland. New bill would allow Maryland food stamp recipients to use them at participating restaurants. ANNAPOLIS, Md. (FOX 5 DC) – A new Maryland bill would expand the state’s food stamp program to allow recipients to use the benefits inside restaurants. The proposed bill will change the state’s food stamp program into a new food supplement benefits program. “I think this is really focused on folks who are in need and that’s why we narrowly tailor it to those who are older individuals above age 60, those individuals who have documented disabilities, and those who are homeless to be able to apply these benefits. It’s not for everyone,” said Sen. Clarence Lam (D – MD 12th District). Senate Bill 752, which introduced was introduced by Lam, has already passed the Maryland House and the Senate. The bill will implement a restaurants meals program and allow specific recipients to use their vouchers inside restaurants all around the state. Restaurants will not be forced to implement the program, rather, they’ll have to apply in order to allow these benefits to be used inside their establishments. Once they do that, qualified individuals will be able to walk into a sub shop, or any kind of permitted establishment, for food. Treasury Sec. Mnuchin says that the request for President Trump’s tax returns is being reviewed by “our legal department,” and that he has not had any conversations with anyone in the White House on the issue. CANADA TO CHANGE THEIR IMMIGRATION LAWS TO PREVENT IMMIGRANTS FROM US ENTERING CANADA: The law would allow immigration officers at the border to reject refugee claims if the asylum seeker has already made a claim in another country that has an immigration information-sharing agreement with Canada.